Built from the ground up as a responsive theme, Futura will automatically adapt its design to look great no matter what screen size or device is being used to view your website. This means your website will work and look perfect on all desktop browsers, iPhones, iPads, and any other tablet, smartphone or mobile device. Need to stand out from the crowd? Need to create something unique? Look no further! 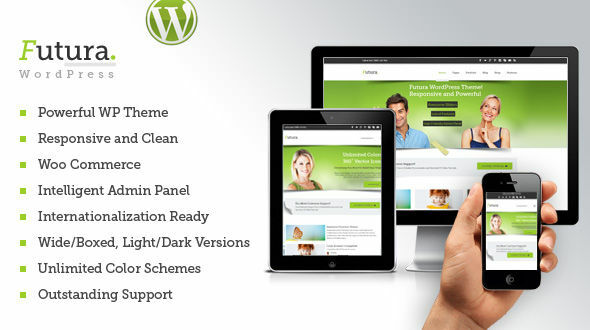 The Futura theme is fully customizable and allows you to easily change the layout, colors and backgrounds. Be it a business website, a portfolio site, a blog or an eCommerce site, the flexibility of the theme will allow you to represent your business in an optimal design. Futura is feature rich and no two versions of the theme will ever look the same! Futura is 100% WooCommerce Compatible, and includes full design integration to match the rest of your website. Sell your products beautifully to anyone on any device.